You may have heard of Rifqa Bary. Rifqa is the young girl from Columbus, Ohio, who converted from Islam to Christianity and then fled to Florida on a bus after her parents threatened to kill her for not renouncing her faith. In my personal capacity as an attorney, I agreed to represent Rifqa in this high-profile Orlando case last year. Rifqa's parents actively attended a mosque in Columbus that had ties to terrorists' organizations around the world. I wrote an extensive memorandum documenting this to the Florida court. Handling Rifqa's case was perhaps the most challenging and stressful thing I have ever done in my life. The case was eventually transferred to Ohio where her parents were located. I agreed to appear on "Fox and Friends" four times as a guest to explain what was taking place in the Ohio case and to discuss Islamic honor killings, which can occur when a very devout Muslim rejects Islam. Just weeks ago, Rifqa turned 18, and we saw a great victory when her freedom and status were secured as a "Permanent Legal Resident" in the U.S. This ensures that she will never have to fear being sent back to her native Sri Lanka where she could easily be killed as one of the highest profile and most recognizable Islamic Apostates in the world. Rifqa represents a symbol of hope for hundreds of thousands of young Muslims who disagree with Islam and want to leave their faith, but fear the implications of doing so. It was a real challenge but a great privilege to defend this amazing young lady who now desires to "preach the Gospel to the nations." Last Monday, the lawyer who represented Rifqa's parents in Ohio – who claims to be a "Muslim scholar" – filed a $10 million lawsuit against me personally in Federal Court alleging "emotional distress" and "damage to reputation" for my some of my comments on one of the Fox News interviews. This same lawyer has filed multiple grievances against me with the Florida Bar, trying to have me disbarred or disciplined as an attorney. In addition to all of this, last Friday a Muslim hacker somehow gained access to our FFPC website, (it appears through the server or some older code) and disabled the entire back-end controls on the site, erased most of the code, disabled the blog and left an obscene message on the events page explaining in broken English who he was and why he was hacking the site. Our web experts tell us that the five-year-old site, which has served us well, is completely unusable and needs to be replaced. I am writing to ask you to make a special gift to help us immediately secure a new website. The cost for a new website with all the various capabilities we need is estimated at about $20,000. A very generous and close friend of ours who learned of this incident over the weekend has come forward and donated $10,000 as a matching gift in order to help us raise the other $10,000. The FFPC website is our single most strategic tool for accomplishing our mission to protect and defend life, marriage, family and religious liberty. In just the last 30 days leading up to the primary election, our website had a record number of more than 27,000 visitors. And with the November election coming up, making voter guides easily available online is a mission critical task. Over the next 50 days, we estimate that well over 100,000 supporters from all over Florida will be looking for our website to get information on candidates, ballot issues and judges before they vote. Would you please make a special online contribution right now to help us in this serious time of need? We have set up a secure, separate site to make an online credit-card or debit-card gift. Or you can just write a check to us at 4853 S. Orange Avenue, Orlando, FL 32806. If we get the funds for the website this week, we can rebuild it – in time to post the voter guides online for early voting and to make them available in hard copy for mass distribution in churches. Most of all, I need and covet your prayers for my wife and family during this difficult and challenging time. Thank you for your faithfulness and support of our work. Since writing this E-mail Alert there there have been a number of quesions regarding the hacking incident: We have attempted to answer these questions in this FAQ list. Thank you so much for your faithful support and prayers in response to the Muslim attacks on me personally, and on the FFPC website after representing Rifqa Bary and helping to secure her freedom in this country. In response to our last e-mail alert on the website hacking there were several questions asked to us about more details about the incident. We would like to take a moment to answer some of those frequently asked questions. Q- How did the hacker actually get into the website? A- The hacker found an exploit (vulnerability) in the website’s “contact-us” page and gained access to back end CMS of the site. Then a virus was used to access to the entire server in Fort Lauderdale where the website is hosted. The technicians we are working with described the hacking as a fairly sophisticated operation that was done in a matter of only 15 minutes. Q- What type of damage was done to the website? A- The hacker erased most of the data and the files. Much of the content was erased and some of the banner ads were also deleted. Q- Why wasn’t the website backed up? A- The site was backed up. The virus the hacker used also destroyed the back-ups of the code on the server as well. The back up was on a seperate system in the same server facility. There were no offsite or online backups used. This will change in the future. Q- How do you know the hacker was a Muslim? 3. The hacker left his name, “Jhon Tairy”. 4. Four days before the hack, I was sued by a Muslim lawyer named Omar Tarazi for 10 million dollars in an Ohio Federal Court. 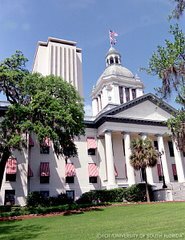 A story in the Orlando Sentinel mentioned that I also led the Florida Family Policy Council which ran on the worldwide web. Q- Did you report this to the authorities? A- Yes. All the facts and details surounding the hacking was reported to the FBI Internet Crime Complaint Center. It was also reported to the Orange County Economic Crimes Division. Q- Why does it cost $20,000 to build a new website? A- The old FFPC website that was destroyed, was a high-end, custom site with original art, a unique design and a number of proprietary features. Good websites for corporations or large organizations like ours with all the speciality features can easily cost upwards of $30-50,000. Very simple websites with only basic features can be purchased for much less. This is one of the most strategic tools that the FFPC uses and we are not looking to just throw up a quick and sub-standard blog site. One of the first bids we received for the new site was actually $25,000. God Bless You. Keep up the good fight! I am looking forward to seeing the voter guides. Man... so sorry to hear that John. what are the special needs that would require this site cost so much? I can build sites. what do you need that would cost so much? Nancy.R (you know your sister's look alike) let me know if I can help you build it. Is there any proof of all this? I am praying for your family. I am sorry this is happening. I plan on making a donation in the near future. "GOD BLESS". So sorry to hear about this loss. I will be praying for God's protection for your family and organization. Thanks for standing up for the truth even when it is difficult. First of all, I am very sorry to hear about the destruction of the web site and I will give a donation. But, please, stop using the term "radical Islam." THERE IS ONLY ONE ISLAM. It is a dangerous, irrational ideology. Any so-called "moderate" Muslim can freak out and become so-called "radical" in a matter of days, weeks, sometimes minutes. How would I know? I'm an ex-Muslim convert. It worries me that even Americans who have firsthand experience of this violent, primitive culture still try to be "politically correct" and "sensitive" to the mythical "moderate Muslim community." Respect and kindness to people who identify as Muslims actually backfires: to Muslims, this indicates your weakness. Tell it like it is! I hope Rifqah is doing well and is protected. Thank you for caring enough and being brave enough to help. 20,000 dollars??! !For a website?? Are you kidding me!!?? John I watched this battle since 2009 its unreal. These radical muslims are crazy. They have no religion but a deadly idealolgy that must be banned from the US. All the US citizens are in danger and that includes me as well. Hmm.. I thought the news said that YOU were the HATEFUL BIGOT!?!?! And this will probably never be reported by the news or it will simply be dismissed as the work of a single fanatic. I find it disturbing how many people are willing to learn about the true issues that face us today. Thankfully, not EVERYONE has their heads in the sand! Thank you SO MUCH for working on Rifqa's behalf. We followed the story through RELIABLE news channels and were so relieved when you were in the home stretch. There are few who would champion such a cause at such personal peril and expense. Thank you for making this stand. May God bless you and keep you safe as you rebuild and regroup! So the hacker is sophisticated enough to hack into your website, but not sophisticated enough to use good English? I also question the claim that you need 20K to rebuild your website... didn't you have any backups? Why not simply reload the old website (from your backups) and up your security a bit? Scam. No way a website costs that much. And no way you guys were dumb enough not to back it up (and if you were, why would we trust you with any money?). $20,000 for a website? Really? Wow. How in the world can you require $20,000 for a website? Thank you so very much for all you have done for this precious girl, Rifqa!! May the Lord Jesus Christ, who is above all, so richly bless you. May He shine His face upon you and give you peace. May He be your shelter through this most difficult storm. We are praying for you. We pray most of all that you will put your trust and faith in the Lord Jesus Christ. He loves you so very much and He is with you in all that you are suffering. May you be so ever blessed!!! May the Lord be glorified in all this, may the hacker find Yeshua Jesus as his savior, may the Lord grant grace to you, and strenght at this time. May every attack bring glory to our Lord, and He be lifted up to the Muslims who desparately need him. I pray all this in Yeshua's precious name. If I was a betting person I suspect you probably never really implemented serious 800 lb Gorilla security measures for your web site. There are a number of things you could have done. Last time i checked it doesn't cost $20,000 to make a website. I'm very sorry to hear about this disaster. Lesson learned: Make and keep a secure OFF-LINE, PHYSICALLY READ-ONLY backup of your entire website and code so recovery is possible. 1. 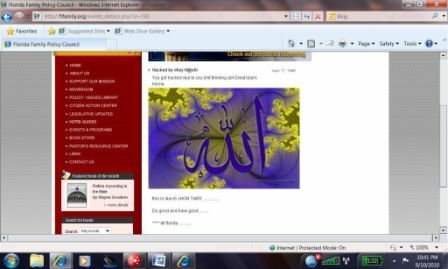 The hacker left a large picture with Arabic letters which read “Allah”. Have you made any contact with the Canadian man Ezra Levant? He was able to successfully defeat a number of suing events by Muslims in Canada - including a human rights attack. He has some interesting You-tube tracking of the human rights tribune. He is also a lawyer and Jewish. You may find him helpful in surviving this attack. By the way we are thrilled that Rifqa is now free. Thank you for all the effort, time and personal cost that has gone into this. We continue to pray for her and those around her. She is a tremendous encouragement by her life and courage. We just wanted to let you know, John, that we thank you a million times for your relentless commitment to helping Rifqa secure her freedom and for your commitment to protecting families here in Florida. Be encouraged that you have many, many people praying for you and your family. Keep it up! P.S. Thanks for the Voter Guide - it will be used. :D God bless.